Serta is a familiar name, having been in the mattress business for more than 50 years. 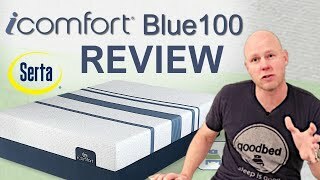 Here we review the company's iComfort Blue 100 mattress, which is available directly online, or through mattress stores. • The TempActiv™ Gel Memory Foam is infused with gel cooling beads that helps the Memory Foam absorb and dissipate excess heat, while still providing pressure relieving support. • The EverCool® Fuze Gel Memory Foam is a conforming and supportive foam that is infused with Gel to provide a cooler feel to the Memory Foam. • This foam combines gentle cushioning with extra support, for firmer comfort. • This foam provides firm support throughout the mattress. Is Blue 300 Firm the right bed for you? The Serta iComfort Blue 300 Firm mattress model is recommended by 41% of owners on GoodBed (based on 27 ratings + 1 review). Do you have a Serta iComfort Blue 300 Firm mattress? Write a Review! Have a question about the Blue 300 Firm? The Blue 300 Firm is an unquilted firm mattress model that is part of the iComfort product line manufactured by Serta. Have an update or correction to our information about Serta iComfort Blue 300 Firm? If so, please take a moment to suggest an edit. 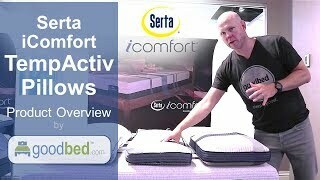 Showing stores with Serta iComfort Blue 300 Firm products nearest to Ashburn, VA. Call store first to confirm availability.